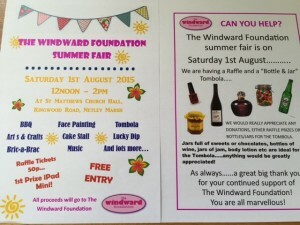 The sun is shining, so you must be thinking it has to be time for another Windward summer fair? Well you’d be RIGHT!! There will be our usual array of stalls, and of course a raffle with some fantastic prizes- including an IPad Mini!! We would love to see you there, and don’t forget that every penny goes back into the Windward Foundation.